Timing – It is important to remember that people have lulls in the afternoon, and might not be the best time to set the most work-heavy activities, and instead make sure it’s an especially engaging time during the session. On the other hand, some people don’t work best first thing in the morning as they’re still in the process of waking up, so best not to go straight into the most intense activities first thing either. 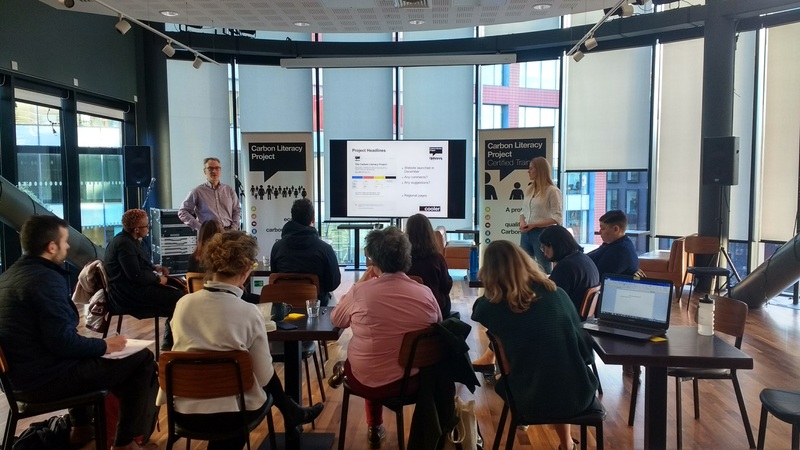 Communication – Particularly in relation to working in large organisations, getting the communications team trained up and having them on board with Carbon Literacy will really help when trying to get others within an organisation engaged. They could help to develop a pre-training message to colleagues explaining exactly what Carbon Literacy is, what is going to happen and why so that there is much more understanding. Equally, this will help make sure the learners don’t turn up and feel intimidated and confused by the session. A communications team could also be a great resource to use when creating presentations for training sessions. Space – Work to utilise the space that you have; use it to during ice breaker activities, and to keep the training fun and fresh. Additionally, use physical objects to engage people and start a conversation. Bring things in that will be familiar to learners so that you can more easily explain a carbon footprint by starting with the carbon footprint of that object. Variation – Getting others to come in and speak to the room so that it’s not just one person can be a great way to keep people interested. Also having multiple trainers can work really well, as the different styles of training that people have can complement others well. Furthermore, having participants from different areas of the organisation, different courses at a University, or just from different walks of life can bring out some really interesting topics of conversation, as everyone has their own areas of expertise and can contribute, making the session more interesting for everyone. Engagement – Making sure everyone is involved with activities, even if some participants are nervous and don’t want to share ideas with the whole group, ensure sure they have some time to share their ideas within their smaller groups so that they are still contributing and getting involved. This can be achieved by asking them questions directly. Asking questions to the room can also be useful if you are unsure of an answer, bouncing this back to the room enables others a chance to input knowledge (although always fact-check if unsure to avoid the accidental spread of false narrative). Having some of our trainers come together to input ideas was a really useful exercise, and this list considers some of the most important aspects when planning a Carbon Literacy training session. We hope you find them helpful, and please comment anything you think is missing and would suggest adding.